A song that hit number 33 in the charts in both the United States and the United Kingdom is one of our Capitol.fm power plays and soon to be a Phoenix hit. 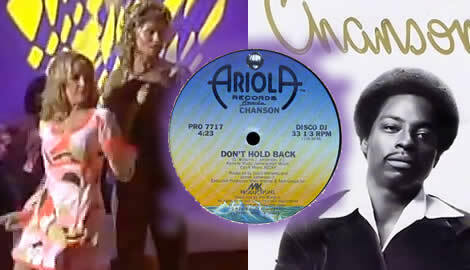 It’s Chanson and their one hit wonder ‘Don’t Hold Back’ and there’s an interesting disco video also. It’s a positive song and tune from the disco era. Chanson and their one hit wonder, Don’t Hold Back. It hit number 33 in the U.S. Billboard Top 100 and the UK Top 40 in 1979. Check out the video coming soon. This will soon be power played on Capitol.fm and listed as a Phoenix track. Looking forward to making it a hit all over again. A new Phoenix track is coming to Capitol.fm. Check out the video in the article on on our Facebook page. It’s a one hit wonder from a studio disco band called Chanson which made to 33rd spot on the U.S. BillBoard Hot 100 in 1979 and even traveled across the Atlantic to the United Kingdom where it also hit no 33 in the UK Top 40. The band was led by James Jamerson Jr who was the son of James Jameson, a legendary bass guitarist who played on hundreds of Motown hits from in the 1960s and 1970s. He died in 1983. The video shows how things have changed since the 1970s. This would never do in the #Me Too world of today. A likely lad approaches a woman in nightclub by slapping her on the bum! If you can forgive that and the dance moves that are more enthusiastic at choreographed then you have one of those songs from the 1970s that oozes positivity and is just fun. It’s disco time on the World radio station. The song was released on Ariola Records and we think it deserves its place on our power play list and soon to be a Phoenix track. Capitol.fm brings the songs of the past to life. If you have a favorite song in the back of your mind that you think the world should rediscover, then email the World Station now, join our social network or let us know here. The band is named using the French word for song and is put together by expert session musicians and singers, professionals in their business.